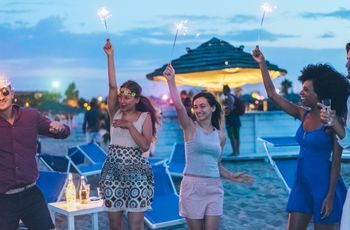 Check out these awesome destinations where you can celebrate an Oktoberfest bachelorette party or beer-themed bachelorette party in authentic style. 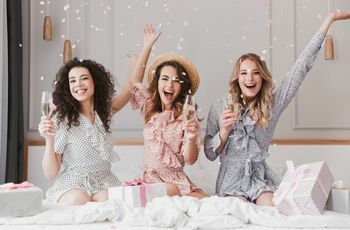 If you’re a bride-to-be getting married in the late fall or early winter, chances are your maid of honor and bridesmaid crew are plotting to throw you a bachelorette party in the fall. Unless you’re traveling to a super warm climate, chances are your theme won’t be nautical (though it’s fine if you just have a thing for stripes and choose the ‘get nauti’ or ‘bride and her mates’ theme anyways!). Halloween’s a fun holiday to base your party weekend around, too, but if ghosts and goblins aren’t your jam, we get it. That’s why we’re here to introduce you to a fall theme that won’t let you down: the Oktoberfest bachelorette party. The authentic German beer festival rages on in late September and through early October and the best part is you don’t have to jet off to Munich to join in on the jubilation (though, if you choose to, scroll right to the bottom of this list!). 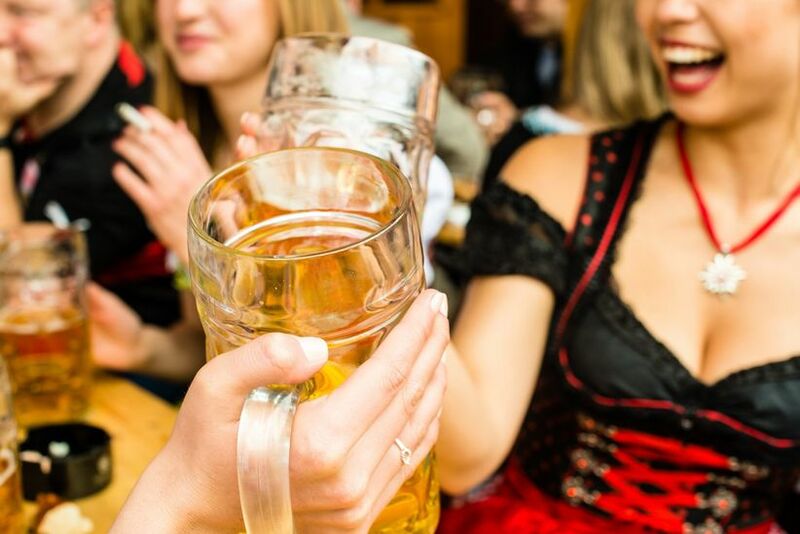 Here's where you can host an authentic Oktoberfest bachelorette party. There are few places in the tri-state area more revered during the autumn than upstate New York, especially along the Hudson River. 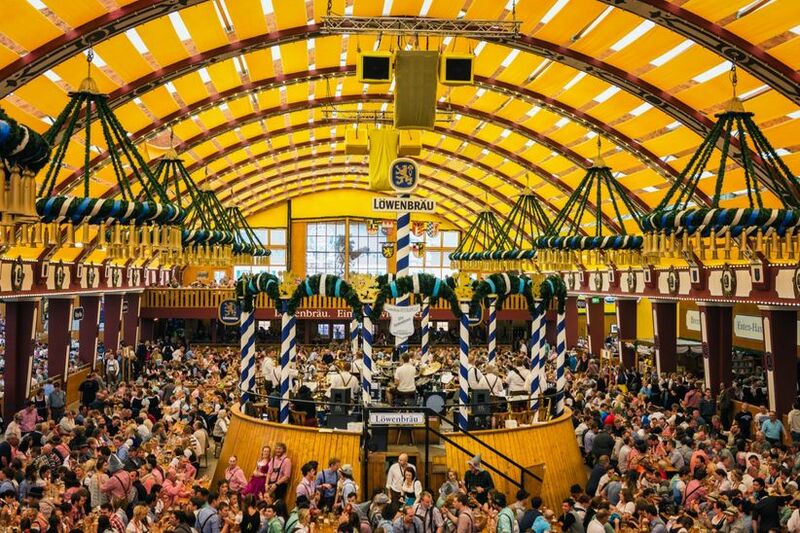 While the region isn’t known for Oktoberfest celebrations in particular, they do host one of the greatest beer festivals in the area, which just so happens to fall on September 16—opening day of Oktoberfest in Munich. The festivals feature a range of 150 beer releases from some of America’s best loved craft breweries, so you won’t be missing out in the selection department. Now in its fifth year, Hudson River Craft Beer Festival takes place at Riverfront Park in Beacon with stunning views of the Hudson. Book a two-night stay at The Caldwell House Bed and Breakfast—just a short, 25-minute drive from the action. 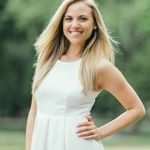 This popular southern city is clearly one of the best bachelorette party destinations, and here’s yet another reason: They celebrate Oktoberfest! NOLA’s infamous Bourbon Street is crowded with a melting pot of cultures celebrating the German heritage around Oktoberfest. For three weekends, you’ll find plenty of authentic, German-style brats, as well as 16 imported German beers and 20 different schnapps. Entertainment options are endless. Each weekend includes live music, a 5K run (or walk, depending on how that hangover sits), and a Beer Stein Holding Contest. Skip the overpriced spots on Bourbon Street and hunker down at the Ace Hotel New Orleans—just a 20-minute walk from all of the action. Here's our complete guide to planning your own New Orleans bachelorette party. Deep in the midwestern heart of Oklahoma, Bavarian culture is widely embraced, especially in Oktoberfest when the city hosts an epic festival. This year it’s scheduled towards the end of the month—from October 19 to the 22nd. 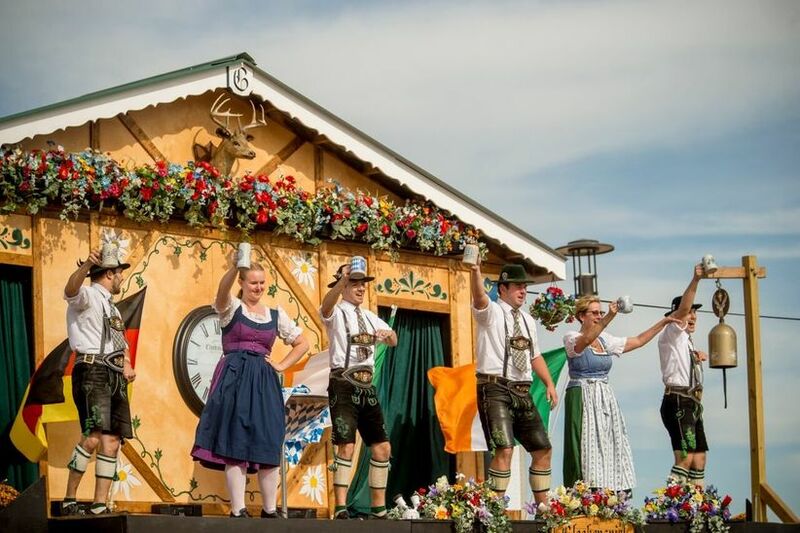 Guests can anticipate festival classics including all of the edible German indulgences, non stop-flowing kegs, Bavarian cheesecake and great music. Settled by the Germans in the 1800s, this beautiful midwestern town continues to honor its heritage with a traditional Oktoberfest celebration. Held every weekend in October, visitors will find a variety of activities, food and live music as well as delicious beer and wine. Many of the events are free of charge, or have a minimal cost of admission. And, for the wine lovers of your group, there are plenty of local wineries in the area. Need a place to stay? Settle down at the Hermann Hill or The Inn at Hermannhof. Each is close distance to all of the festivities and offers a variety of lodging options, ranging from luxurious suites to private cottages. From September 14-17, Oktoberfest is going down in Heritage Park in Frankenmuth, Michigan. The region has a unique German heritage that dates back more than a century, so there’s no shortage of folks trying to hold onto their German ancestry. The festival typically draws anywhere from 7,000-10,000 visitors and includes a wide array of activities, live music and an endless stream of food selections and beer. And, for those Hofbrauhaus lovers, know this: The brewery became an official sponsor of Frankenmuth Oktoberfest in 1997. In a small Pennsylvania town, you’ll find Reading Liederkranz, AKA “the clubhaus.” It was founded by a group of friends back in 1885 who had several things in common—one of them their German heritage. Today, 132 years later, the club still hosts an Oktoberfest celebration to remember with a Biergarten full of food, drinks and tons of beer. The festival runs from September 27 through October 1 so coincide with the happenings in Munich. The best part? Admission is cheap as can be—just $8 for non-members. It might be the land of sunshine and one of our favorite bachelorette party destinations, but L.A. also dabbles in beer celebrations—namely, Oktoberfest. Alpine Village in Torrance has been keeping the German tradition alive since 1968. During September and October, the event features more than 100 craft beers from over 40 breweries, as well as German culinary staples including brats, chicken and pork schnitzel and pretzels. You and your crew can choose to watch—or participate in—the various activities such as Chicken Dance, Das Boot and a Stein holding contest. 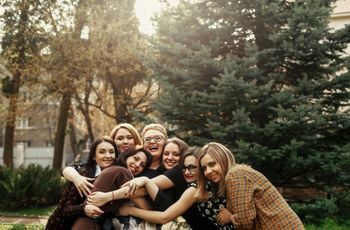 While you certainly have your fair share of Oktoberfest celebrations to choose from stateside, there’s no comparing them to the real deal when it comes to unique bachelorette party ideas. If you and your friends are up for jetting across the Atlantic, there’s much to enjoy at the famous beer festival, which this year will begin on Saturday, September 16 and run through Tuesday, October 3. This will mark the 184 year that this festival has been going on, so you can expect the crowds to swell by the millions. Stay at Hotel Muenchen Palace, just a short 10-minute subway ride away from the festivities. 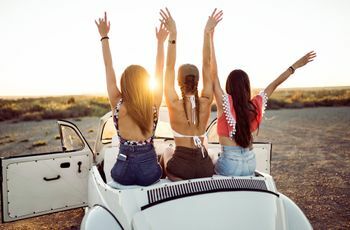 It’s reasonably priced, especially considering its location, and has a luxury vibe that you and your gal pals will love.